�The formation of the Saint Hannibal Empowerment Center, Inc. (SHEC) is a result of a long organizing process undertaken by a group of Rogationist priests and brothers under the leadership of Fr. Gabriel Flores, RCJ.� In June, 1998, the group began with community immersion in Pasay City, specifically in the depressed areas of six Barangays located in Malibay, Maricaban, Tramo and Apelo Cruz.� The immersion lasted for five years within which the concerned group of Rogationists lived and closely interacted with the people. Eventually, as the needs and concerns of the communities were expressed and explored in depth, the SHEC has been established to allow for a more organized and structured approach to empower the communities. 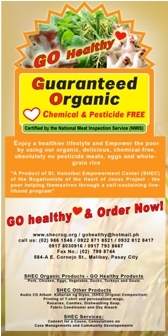 �The SHEC was officially established in December, 2003, through the setting up of an office in Barangay 165, Rodriguez, and Malibay, right inside one of the depressed areas and within easy access by the other communities.� This was made possible through the blessing of Fr. Giorgio Nalin, RCJ, Superior General of the Rogationists and the approval of the Philippine-Indian Delegation headed by Fr. Bruno Rampazzo, RCJ, Major Superior, and through the permission granted by His Eminence Gaudencio Cardinal Rosales, DD, in collaboration with the Parish Priests of San Juan Nepomuceno, San Roque and Mary Comforter of the Afflicted. The organization became a SEC-registered non-stock, non-profit organization in July, 2005. The SHEC envisions a� community of Spirit-led persons committed to following Jesus Christ in His communion with God the Father and in His proclamation of the Kingdom of God, with St. Hannibal as the inspiration and Mary as the guide. Its mission is to empower the poorest of the poor and catalyze an integral Christian transformation of urban poor communities in collaboration with the local Church by a holistic process that addresses concerns on housing, livelihood, education, health, environment and sanitation, justice and peace, youth formation and values formation. 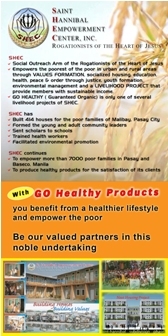 The goals of SHEC consist of assisting in alleviating poverty among urban poor communities in Pasay and other cities in Metro Manila; and building the foundation of community transformation through intensive values formation. Its objectives are, specifically, to facilitate the organization and formation of people�s organization that are self-sufficient and empowered, facilitate the values and spiritual formation and capability building of urban poor leaders,� to assist the urban poor / informal settlers of Pasay and other cities in Metro Manila in realizing their dreams of achieving security of tenure through in-city relocation, to facilitate the implementation of economic programs and basic social services in urban poor communities, and to facilitate access to formal education in favor of the poor and deserving students.